Films have been set on trains since the birth of cinema. Throughout November, We're going to look at Hollywood films that were set on locomotives or featured trains as an integral part of the story. First up is director Delmer Daves 1957 Western, 3:10 to Yuma. 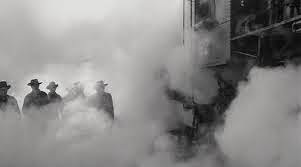 3:10 to Yuma is the classic waiting-on-a-train movie. Only the last five minutes of the film occur on or near a train, but the locomotive's imminent arrival is the driving obsession for the two main characters. For rancher Dan Evans (Van Heflin), the 3:10 to Yuma is his last chance to prove to his family, his community and himself that he is more than a weak-willed man who always takes the easy way out. Outlaw Ben Wade (Glenn Ford) desperately wants to avoid the train. For him, a trip to Yuma means more hard time in the penitentiary. 3:10 to Yuma begins with Wade and his gang holding up a stagecoach in Arizona territory. They steal the gold from the coach and kill the driver while Evans and his sons watch helplessly from the ridge above. Eventually, the local authorities round up a posse and arrest Wade with the intention of sending him back to prison. The thankless and dangerous task of getting Wade to the train is left to Evans, as one-by-one his comrades are either killed by Wade's gang or lose their courage. Both Ford and Heflin give excellent performances in 3:10 to Yuma. Heflin began his career playing suave characters, but in the 1950s he began acting in Westerns. He is particularly good here as an honest, decent man who is in over his head. He is so sweaty and nervous that he can barely open a window without getting shot at and as the clock ticks closer to 3:10 he gets more and more agitated. 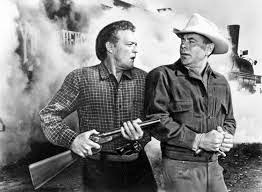 Dan Evans (Van Heflin) and Ben Wade (Glenn Ford) play a psychological game of cat and mouse in 3:10 to Yuma (1957). Ford plays against type as a wily villain. He is the type of personality who is working all of the angles, all of the time. When he's eating beef stew for supper he charms his way into getting the best cuts of meat, and when he's holed up in a hotel room with Evans he uses every psychological trick in the book, including offering the down-on-his-luck rancher vast sums of money, to let him escape. 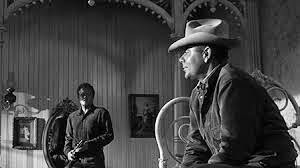 Delmer Daves does not receive the adulation of a John Ford, but he is one of the best directors of Hollywood's golden age and 3:10 to Yuma is his finest film. Daves directs the film with both beauty and economy. There's not a moment wasted in the 92 minutes of the film and Daves adds small flourishes, like a solemn funeral procession, that add to the tension. 3:10 to Yuma is available on DVD and video on demand. Next up, Buster Keaton's silent classic, The General.